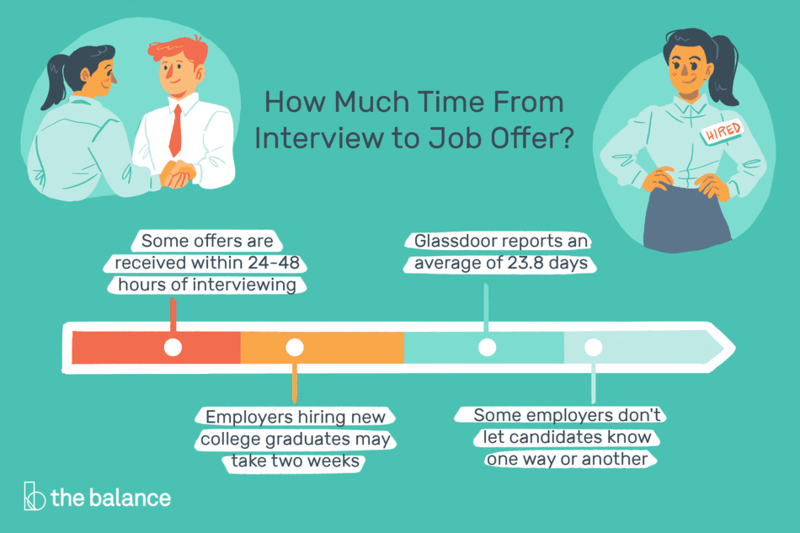 How long does it typically take to get a job offer after an interview? When will you hear from an employer? There is no definitive amount of time that it can take to go from sitting for a job interview to receiving an actual job offer. The hiring process can vary from employer to employer, the type of job you are applying for, and the industry in which you work. Here’s a breakdown of the things that happen and the time it usually takes to go from interview to offer. The hiring process begins when a company posts a job opening and begins accepting applications for that job. The job posting is followed by a review of the submitted applications, which may be processed by an applicant tracking system and then reviewed by a hiring manager. Next, a portion of the applicants will be invited to participate in the interview process, which might consist of one, two, or multiple interviews (some might be phone, Skype, or Zoom, and others may be in person). If the company reaches out to you asking you to do a video interview, confirm what type of video conferencing software or app they prefer to use, schedule your interview for a time you know you will have seamless internet, and make sure that you will have access to a private location. Do a test run of the video chat program ahead of time, if you don’t use it often. After the first interview, they’ll usually let you know what to expect next. If the first interview is over the phone, they’ll likely want you to do a second interview in person. If you met in person the first time, they should inform you of what will come next, either another meeting or a decision. The time from job offer to acceptance is also about two weeks. However, this is the average for one sector of the job market. For others, offers were received within 24 to 48 hours of interviewing—or the hiring process dragged on for weeks. Unfortunately, some employers don't let candidates know one way or another, even after they have interviewed them. Jobvite’s 2018 Recruiting Benchmark Report shows an average time-to-hire of 38 days, down from 41 days in 2015, while Glassdoor reports an average of 23.8 days in the United States. That number can vary significantly based upon the employer and the type of position being filled. For example, Glassdoor reports that the job with the fastest interview process is waiter at 8 days, while the slowest is professor at 60.3 days. There are a number of reasons why an employer might not give you a job offer right away. Firstly, he or she may have more candidates to interview. Depending on scheduling and the number of candidates, this part of the process can take a while. Even if an employer wants to hire you, he or she may have to run a variety of checks first, including background or credit checks. The hiring manager may also check your references or fact check your resume. An employer may also need to take the time to put together a job-offer package. Another snag that might cause a delay in your job offer might be a formal human resources (HR) process that requires an HR representative to sign off on a number of steps in the hiring process. The job opening itself might also get delayed or rethought depending on internal issues within the company (this might be due to changes in management, the budget, or a change regarding the person who is vacating the position). Finally, the hiring manager might also simply be busy with other projects and might not make this hiring process a priority (as frustrating as that is for a job applicant to hear). Don’t put all your eggs in one basket. As perfect as this job may seem to you, it’s still a good idea to keep applying and interviewing for other open positions. You can also make a plan for how you want to follow up with the company after the interview. There is one thing you should do immediately after the interview: send a thank-you letter or email to the person who interviewed you. Then, you begin the waiting game. If the process seems like it's taking forever, there are some guidelines to follow. If 10 to 14 days have passed and you haven’t heard back from the employer, you might consider politely checking in again with an email follow up or phone call. Plan to expand on something you discussed in your interview or mentioned in your resume; this is a nice way to remind the hiring manager of who you are and why you are a good fit for the position.